Sweet Freedom: What...is your quest? I have been charged by Dad with a sacred quest...to seek a perfect, dunkable peanut butter cookie recipe. they shall be sweet enough to avoid the sentence: "it would taste good with some sugar." This is my third attempt at the perfect, dunkable, peanut butter cookie...and I failed, again. The Problem: they are apparently too moist in the middle to soak and support my dad's milk. Damn. I am posting the recipe anyways, because, for anyone who doesn't scrutinize every cookie with the previously mentioned criteria, these cookies are a success. 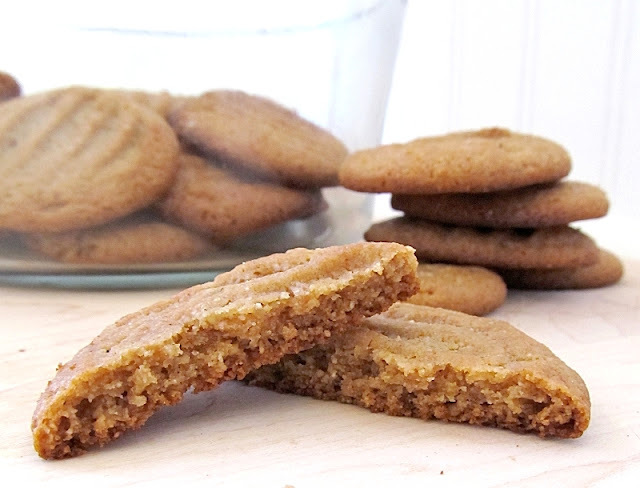 They are crisp on the outside and chewy in the middle—my favourite kind of peanut butter cookie. Make sure you chill the dough, or your cookies will spread too much. I made the recipe by weight, but I'll include the rough volume measurements. * I could not find a consistent weight/volume conversion for spelt flour, and I've been searching for a while. I finally tested it myself—it came to about 142 grams/cup, which is the same as many other wheat flours. 1. With an electric mixer, combine butter, honey and maple syrup until all lumps are gone. 2. Add peanut butter and vanilla—mix until smooth. 3. In a separate bowl, sift flour and stir in other dry ingredients. 4. Add dry to wet, and, with a spoon, mix until just combined. 5. Chill the dough for at least an hour, but preferably longer (I made my first batch 6 hours later, and the rest the next day). 6. Preheat oven to 375F and line a cookie sheet with parchment paper. 7. Roll dough into balls and press with a lightly floured fork. 8. Bake 8-9 minutes, or until edges are golden (the centers might look a bit uncooked, but that's ok—they'll firm up once they cool). In case you're wondering, Dad's favourite dunk cookie, so far, has been the un-jammed Peanut Butter and Jam Thumbprint Cookies, but apparently they tend to fall apart in his milk. Well, I haven't given up—I have a long list of cookie baking tricks already written out, so expect more peanut butter cookie recipes. Your father should take up baking himself and try meeting his own standards! Maybe then he will realize the difficulty of the task he has set. Your cookies look good to me! What… is your favourite colour? Haha, I like both comments!